Dr. Charles A. 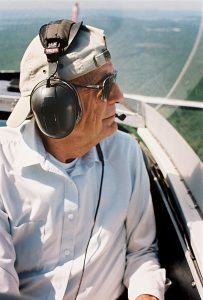 “Chuck” Ratté, geologist, author, educator and devoted father and husband, died at his home in Saxton’s River on February 20, after a brief illness, days shy of his 92nd birthday. Always a man of gentle disposition, humility, and quiet confidence, his profession immersed him in nature’s incalculable violence: earthquakes, volcanoes, shifting tectonic plates, and the advance and retreat of ancient glaciers and prehistoric seas. He seldom sweated the small stuff, encouraging others to follow his lead, and often carried some found fossil in his pocket as a reminder of our brevity on this earth. As the Vermont State Geologist from 1976 to 1991, Dr. Ratté successfully transferred the responsibilities of the Vermont State Geological Survey from the University of Vermont to the Agency of Natural Resources. He later conducted a landmark study of radioactivity, which led to the restriction of nuclear waste siting in Vermont. In 1989, Dr. Ratté spirited legislation through the State House that redefined the mission and significance of the State Geologist. Born in 1927 in Brattleboro to Alphonse and Elizabeth (Robinson) Ratté, he enlisted in the U.S. Marine Corps in 1945 during the final months of World War II, just days after his graduation from St. Michael’s High School. After his military service, he received his bachelor’s degree in geology from Middlebury College and his master’s degree at Dartmouth College. He later earned his Ph.D. from the University of Arizona, with a specialty in mineralogy and ore deposits in 1963. While a summer field assistant in 1953 for the U.S Geological Survey in Glacier Bay, Alaska, Dr. Ratté courted Judith (Templin), and the couple married in 1955. During his Ph.D. studies in Arizona, and later employ with U.S. Steel in Utah, the Rattés had two daughters, Michele and Lisa. The family moved back to Brattleboro, Vermont in 1963 when Dr. Ratté accepted a professorship post at Windam College, where he pioneered student geology programs in Spain and the Caribbean Islands, chaired the geology department, and was an admired presence on campus for 13 years until the college closed in 1976. He was also a visiting professor at the University of Kentucky from 1991 to 1993. While living on Martha’s Vineyard, Dr. Ratté often presented guest lectures and led geology and fossil hunting expeditions to the Gay Head Cliffs and terminal moraine, sharing his delight upon finding some hitchhiker boulder from thousands of miles away. If his joy for surveying eroding mountains or patrolling long evaporated inland seas had a rival, it would the endless hours he spent at Tradewinds tossing tennis balls for his devoted Golden Retriever, Emmie. Dr. Ratté was the author of numerous articles in professional journals and scientific publications and was finishing a book about Vermont’s unique geology at the time of his death. He is survived by his wife of 65 years, Judith Ratté of Saxton’s River; daughters Michele Ratté and son-in-law, Eric Shenholm of Saxton’s River; and daughter Lisa Ratté of Calais, Maine; brothers Edward Ratté of Mineola, New York and Alphonse Ratté of Derry, New Hampshire; a sister, Jo Ann Del Coriano, of Ashville, North Carolina, and was predeceased by sister Dorothy (Ratté) Austin in 1995. Dr. Ratté’s ashes will be interred in the Saxton’s River Cemetery, Saxton’s River, Vermont. The post Charles A. “Chuck” Ratté appeared first on The Martha’s Vineyard Times.